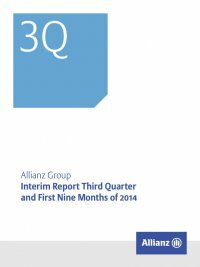 Interim Report Third Quarter and First Nine Months of 2014 Allianz Group68 Reportable segments – Property-Casualty (Continued) Reportable segments – Property-Casualty (Continued) € mn German Speaking Countries Western & Southern Europe Iberia & Latin America nine months ended 30 September 2014 2013 2014 2013 2014 2013 Gross premiums written 9,990 9,726 8,045 7,953 3,307 3,502 Ceded premiums written (1,560) (1,563) (577) (538) (479) (550) Change in unearned premiums (874) (844) (50) (170) 3 (92) Premiums earned (net) 7,556 7,319 7,418 7,244 2,831 2,860 Interest and similar income 852 855 646 661 146 152 Operating income from financial assets and liabilities carried at fair value through income (net) 18 (42) (4) 10 9 5 Operating realized gains/losses (net) 129 44 – – – – Fee and commission income 96 110 28 18 – – Other income 21 19 5 5 17 – Operating revenues 8,672 8,305 8,093 7,938 3,002 3,017 Claims and insurance benefits incurred (net) (4,981) (5,486) (4,647) (4,515) (2,028) (1,960) Change in reserves for insurance and investment contracts (net) (378) (266) (30) (32) (4) (3) Interest expenses (6) (16) (14) (8) (2) (2) Operating impairments of investments (net) (10) (9) – – – – Investment expenses (76) (70) (73) (72) (11) (10) Acquisition and administrative expenses (net), excluding one-off effect from pension revaluation (1,908) (1,860) (2,026) (1,926) (731) (752) Fee and commission expenses (87) (102) (27) (28) – – Restructuring charges (2) (4) – (1) – – Other expenses (15) (13) (4) (3) (1) – Operating expenses (7,464) (7,827) (6,821) (6,585) (2,777) (2,727) Operating profit (loss) 1,208 478 1,272 1,353 225 290 Non-operating income from financial assets and liabilities carried at fair value through income (net) (46) 5 (17) 1 5 3 Non-operating realized gains/losses (net) 118 86 96 206 13 15 Non-operating impairments of investments (net) (20) (16) (75) (137) (2) (12) One-off effect from pension revaluation (530) – – – – – Amortization of intangible assets (2) (2) (17) (16) (1) (1) Non-operating items (480) 73 (12) 54 14 4 Income (loss) before income taxes 729 551 1,260 1,408 239 294 Income taxes (172) (158) (466) (463) (63) (95) Net income (loss) 557 393 794 945 176 199 Net income (loss) attributable to: Non-controlling interests (1) (1) 12 14 4 4 Shareholders 558 394 782 931 172 195 Loss ratio3 in % 65.9 75.0 62.6 62.3 71.7 68.5 Expense ratio4 in % 25.3 25.4 27.3 26.6 25.8 26.3 Combined ratio5 in % 91.2 100.4 90.0 88.9 97.5 94.8 1 The reserve strengthening for asbestos risks in 2014 at Fireman’s Fund Insurance Company of € 79 MN had no impact on the financial results of the ­Allianz Group and Fireman’s Fund’s combined ratio under IFRS. 2 The 2014 analysis of the ­Allianz Group’s asbestos risks resulted in a reduction of reserves and a positive run-off result of € 86 MN reflected in the operating profit for 2014. 3 Represents claims and insurance benefits incurred (net) divided by premiums earned (net). 4 Represents acquisition and administrative expenses (net), excluding one-off effect from pension revalu- ation, divided by premiums earned (net). 5 Represents the total of acquisition and administrative expenses (net), excluding one-off effect from pension revaluation, and claims and insurance benefits incurred (net) divided by premiums earned (net). 6 Presentation not meaningful.